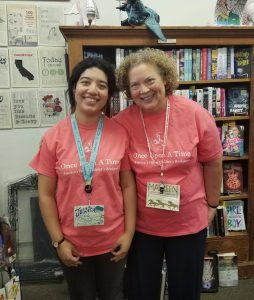 We’re delighted to introduce a new monthly feature where local bookstore owner, Maureen Palacios and her daughter Jessica, of Once Upon a Time, weigh in on what they’re loving in hopes that you’ll love their suggestions too. Established in 1966, Once Upon a Time in Montrose, California is America’s Oldest Children’s Bookstore. 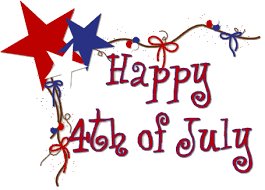 Many things come to mind when you mention celebrating the most American of holidays, Fourth of July — fireworks, picnics, parades, food and family, among others. As we take a look at a roundup of Fourth of July titles, one of my new favorites—although not technically an Independence Day title—is filled with emotional resonance that conjures up all the great feelings of a well-spent day of celebration. 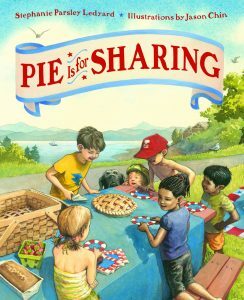 The debut picture book by author and poet Stephanie Parsley Ledyard, whose words are expressively coupled with artwork by Jason Chin, Pie Is for Sharing (Roaring Brook Press) is a first book about the joys of sharing. With a similar cadence to that wonderful picture book, Stars by Marla Frazee, this book celebrates a rich, diverse community in the everyday delights of climbing a tree, sitting on a warm beach towel and, of course, sharing every morsel of a pie. Chin expertly intersperses bits of red, white and blue in each page to magically and triumphantly end in a glorious cascade of fireworks! A perfect read for ages 2-6. 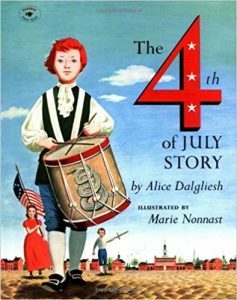 Geared to the 4-8 age group is The 4thof July Story, written by two-time Newbery winner Alice Dalgliesh and illustrated by Marie Nonnast. First published in 1956, this paperback has adequate information for late kindergarten and a bit higher, but not for much younger and its illustration style may seem dated to some. The concept of war is a tough enough subject, and trying to explain the origins along with what actually happens may be too much for younger learners. I did enjoy remembering that the origin of “Congress,” which was newly enacted in Philadelphia during the run up to the Revolutionary War, means “coming together.” This simple telling of how the holiday began is why the book remains a primary teacher favorite. Still worth revisiting. 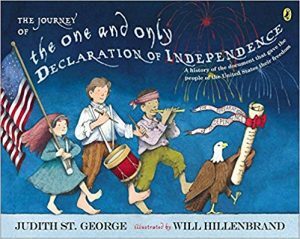 For a more contemporary approach for older children, I highly recommend The Journey of the One and Only Declaration of Independence, written by Judith St. George and sprightly illustrated by Will Hillenbrand. This 46-page picture book is not so much about the actual Fourth of July holiday, but rather about the history of the document which it inspired. Young readers, ages 7 and up, will embrace the fun and engaging text, with much more current information about the precious piece of parchment that outlines our country’s initial thoughts on freedom, equality and liberty. Still resonating in today’s divisive political climate, this book, with a biography in back, is a terrific addition to your holiday book shelf. You can click on the colored links for each book reviewed and go directly to the bookshop’s web store to place an order. Good Reads With Ronna does not get compensated for any purchase. All opinions expressed are those of Once Upon a Time.